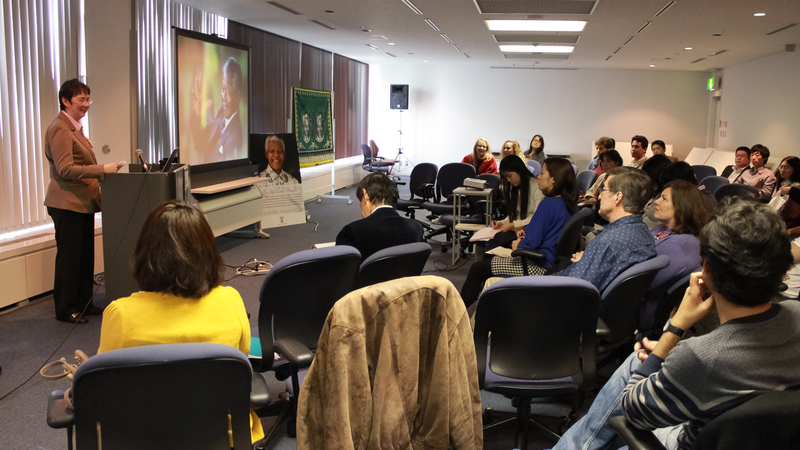 On 28 March 2015, UNU-IAS held the fourth session in its Mandela and I monthly lecture series, welcoming Prof. Gerry Yokota of Osaka University as a guest speaker. Prof. Yokota, a professor of interdisciplinary cultural studies with a focus on gender and peace, was active in the anti-apartheid movement during the 1980s and 1990s. She met Nelson Mandela as a member of the executive committee that welcomed the former president of South Africa when he visited Japan after his release from prison. She described Mandela as someone who tried to communicate with everyone, looking beyond race and rank, and attributed the universal respect people held towards him to his efforts to interact with everyone equally. From Nelson Mandela, she learned to avoid unnecessary cynicism in order to achieve justice and peace, and warned participants against becoming overly skeptical towards kindness of others. Encouraging participants to learn more about Mandela through a variety of resources, she introduced music, comic books, movies, documentaries and books, including Favorite African Folktales which was edited by Mandela. After sharing her experiences as an anti-apartheid activist, she finished the lecture with a message to the audience that they should not mourn over Nelson Mandela’s death, but take action towards a better world.